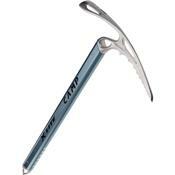 Carry the Camp USA X-Lite Ice Axe for lightweight security on your next burly ski descent. The aluminum head is shaped so your hand grips the curved adze directly above the shaft for greater comfort and balance on cookies-and-cream traverses. It also allows split-second transitions to self-arrest mode when you lose your footing. The steel spike easily penetrates hard-packed snow, turning the X-Lite into an anchor in a pinch, and an included leash attaches you to the axe so you don't lose it fifty feet from the summit.